I had a chemo port placement and chemo port removal for chemotherapy in 2012 and in August, 2015, I accompanied my sister for a chemo port placement. 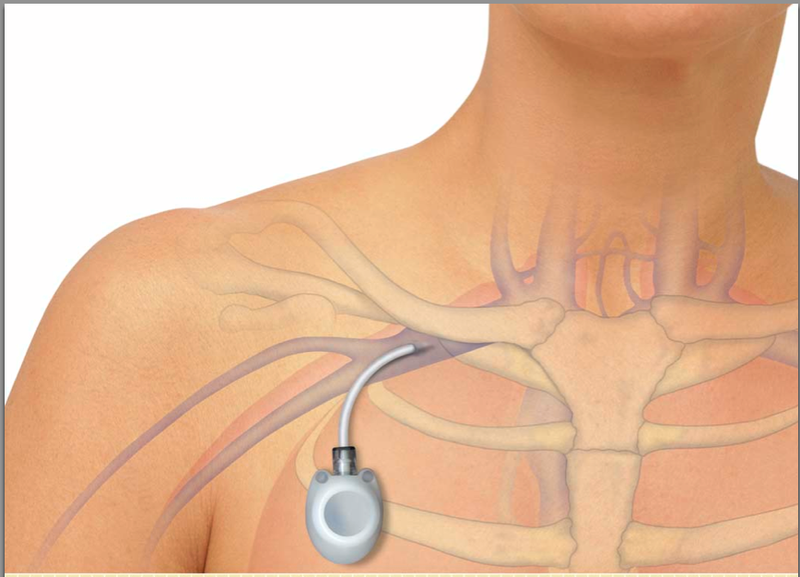 A port differs from a PICC line as a port is surgically implanted into your body and has a tube or catheter that is connected to an artery or major vein. It can stay in for several years if need be. A port saves your veins and becomes your good friend during Chemotherapy and with the countless blood tests that go with it! You may wonder if it is worth everything you have to go through to have a port. My answer would be, yes, as it does save your veins! When I had my port put in, I didn’t realize it was such a big deal. It is an outpatient surgical procedure with a pre-op room, operating room, surgery, and recovery room. I don’t know what I was expecting, but not that much fanfare! The actual procedure took about an hour. The surgical team gives you twilight sleep, but it didn’t do anything for me. I was wide awake and remembered the entire procedure. They asked if I wanted more so I would fall asleep. I did not. I hate that drugged up feeling, but everyone is different! My sister said she did fall asleep during some of the procedure. The surgeon numbs the area with Lanacane, a novocaine-type drug, makes an incision, the tube is connected to the artery or vein, and then the port itself is sutured into your body. Then the area is stitched closed, and they take you to recovery. I was not able to drive home and was warned ahead of time to bring a driver. I also had to take it easy for 3 days with no lifting, stooping, or using my upper body. I felt quite fine after port placement, but my sister had a different experience. She was very light-headed and weak from the twilight sleep meds. And her blood pressure plummeted. It is really the best idea if you have a wheelchair to leave the post-op area. My sister would have collapsed had she not been in the wheelchair. But as soon as I got some food into her (salty soup) and got more fluids into her, she started feeling better immediately. Before you have your port placed, it is a great idea to ask the surgeon where it is going to be placed. If they can avoid your bra straps, this will help enormously in the future as many women complain greatly about this. My surgical area hurt like crazy for 2 weeks. Many people have no pain at all. My theory that mine hurt so much was because I had a heavy breast on that side and wasn’t able to wear a tighter bra because I had a Mastectomy just 3 weeks before the port placement. So my breast pulled on the incision. I took Motrin, but it really didn’t cut the pain that much. The majority of people do not have the kind of pain that I did. The other thing I wasn’t prepared for is how the port disrupts your sleep. I was not able to sleep on the side with the port for over 6 months! Since I had a mastectomy on the other side, it was sleeping on my back or nothing! Then one day, all of a sudden, all discomfort left, and I was able to sleep on that side. During Chemo, my port worked most of the time. On 4 occasions, the port got clogged up. So the Chemo Nurses would have me do all kinds of acrobatics to get it to unclog. They were always successful with almost standing on your head (wig fell off once! ), lying back in a chair, or putting your hands over your head and coughing! It always worked. They do have drugs they can insert into the port to unclog if necessary. Thankfully, I did not need that done. Your Oncologist will let you know when the port can be removed. In the interim, if it is not being tapped for chemo or blood tests, you must have a port flush at least once per month at your local blood draw lab or Oncologist’s office. I have gotten letters from people who have had their ports in for as long as 10 years! They were afraid to take them out or afraid of recurrence. Those are legitimate fears, but trust me, taking it out as quickly as your Oncologist recommends is the best advice I can give. Port removal is not as traumatic as port insertion. For one thing, you are so happy to have it out! First, blood tests are done to check your platelets and clotting factor. Mine were normal, so they were able to proceed. They have to make sure your blood will clot and that you don’t keep bleeding out of the artery. Good idea, huh? At my medical facility, the removal was done in a surgical room, but not a full-blown operating room. Two assistants prepped me and my chest area. They did not offer me any drugs or twilight sleep. My surgeon told me that everyone gets really tough during Chemotherapy, so drugs usually aren’t necessary. He was serious and spoke truth! The surgeon numbed the area with Lanacane. First he made an incision then surgically removed the catheter from the artery. He had to put pressure on that area for about 5 to 7 minutes to make sure the bleeding stopped. Then he removed the port by cutting the sutures that held it in place. Again, he put pressure on the area for several minutes. Once the port was out, he made an inside row of dissolving stitches and an outside row of dissolving stitches. The procedure itself took about 30 minutes. I was given instructions to take it easy for 3 days, again not stooping, lifting, or exerting my upper body. The Lanacane is wearing off as I write this, and it is starting to hurt a little. This pain will be fine with Motrin! I can tell that already! There you have it. Everything you wanted to know about your Chemo Port! I hope the information is helpful! If you need chemo hats – either for men or women, I began my store – http://www.hellocourage – because my medical bills were outrageous! Check them out! Hi Denise. That is true. My port has saved my sanity. My experience was the same as yours with insertion. I felt like Frankenstein for about a week and every time I turned my head, I could feel it. After that first week was up, I felt fine and have been fortunate to not have any additional problems over the past 5 month. It feels like a part of me now. Not sure if that’s good or bad. LOL! I can sleep on both sides and even my stomach. The only real problem I had was the fact that my port is on my left side and my seat belt went right over it. I had to find a seat belt cushion to go over it but once I did, problem solved. Thanks for the info on the removal. I was concerned about that. I remember asking one of the chemo nurses if they were going to have to dig it out!! I’m not sure how long I’ll have mine because I did neoadjuvant chemo and I’ll have my surgery next month but it has been great because I know my veins would be shot otherwise! helping others about the seat belt issue! We do become tough, don’t we? LOL! I just getting started. I got my port three week ago, I had some type of sinus infection, so they had to test and make sure it was not cancer. I having my treatment starting Monday, and I cant get my cream that goes on your skin for the port, because the insurance company wont approve it yet? Do I really need it on my first treatment? You are probably referring to lidocaine cream. It rather numbs the area before they insert the needle into the port. I never did it and never got the cream because I had to pay for it. It was not that painful at all and then eventually the skin toughen up and I never even felt it. Good luck to you. It is also hard and overwhelming but you can and will get through this!! Oh my best wishes to you. I am going through my second case of cancer. I was “lucky” to be able not to had a port so far and keep my veins in good enough condition. But now I am in need of a port. I was wondering, what is neoadjuvant chemo that you mentioned mean? Hi Galina – oh so sorry you have to do this for the second time. Wishing you well…if I can be of any help, please email me! I had neoadjuvant chemo prior to having a mastectomy in November of 2014. Unfortunately, the chemo did not shrink my tumor. My port was placed in June of 2014 and I still have it. So far, I have had no issues at all with it. No pain, numbness or clogging. Can’t seem to get an answer from my oncologist as to when I can look forward to getting it removed so for now it seems it will be with me for awhile. Hi Donna, I am so sorry you are one of the ones with port pain! I so get it! I can use only one arm/side for needles because of the fear of lymphema on the other. I’m glad I have my port, but I must say that it remains (after 4 months) very tender. There’s a local anesthetic called Emla (can get the generic form, needs script, dirt cheap) that works wonderfully on me. I apply it about a hour before infusion, and it deadens the port area. I had my port inserted 5 days ago and it was more discomfort than I had counted on. It is much better today. I had been forced to sleep on my back until I discovered a trick. If you hold a small pillow (I have a squishy travel pillow which is like a normal pillow but smaller) right up against you, cuddle it and push it a bit under you, you can sleep in comfort. It works so well for me. I hope it will work for others as well. My first chemo is in 3 days. Thanks so much for the tip, Carol. This will help others! And best of luck to you. I can truthfully say that my port was the most uncomfortable part of my whole chemo treatment. The site remained black and blue and very tender for the entire time of chemo. The Emla did help during the infusions. I lost about 20 lbs. during my treatment, and the port started to migrate to the surface of my skin after awhile and was almost sticking out by the time it was removed. Even the oncologist no longer wanted to use it because of the way it looked and the surgeon said it looked “nasty”. I never had any trouble with clogging or infection. Removal Day was the best day of my life! I am continuing with infusions of Herceptin every 3 weeks through the veins with no problems at all. (I’m told that Herceptin doesn’t break down the veins like A/C and Taxol do, because it is not, strictly speaking, a chemotherapy drug but is a targeted therapy.) Bottom line: If you’re having trouble with your port, stick it out as long as possible, and just know that there is light at the end of the tunnel. any idea how much it costs to remove port? Out of pocket, no insurance. Thanks much!! If memory serves me correctly, it seems mine was about $1,200 – however, I have coverage. But my insurance company did not pay all of that, only partial which hospital accepted. I would definitely shop around, but it is probably tough to get a “quote”!! My port was in my arm, right above the bend but yet on the inside part of my arm. The cost was $600, which my insurance paid for $475 of it and the clinic wrote off the $125 excess cost. Hello, I just came across your website while doing a search for chemo ports. I just had mines inserted 4 days ago, I was diagnosed with Breast Cancer on May 3. It feels very weird like someone mention. Finding a comfortable position has been the worst, I’ve tried my bed pillows but that’s only temporary comfort. I do have a travel pillow at home I will try that tonite. I’m also discomfort raising my arms, but presume this is normal,did anyone else have this issue after their chemo port placement. I have a question did anyone have tingling sensations around their port area. Its not all the time but I do get it. It feels like when your fingers or toes go to sleep. Like you I created a blog but more so just to clear my head of all things I was thinking and going through during this journey thus far. I had my port removed because I was having so much trouble with it. The nurses could never get blood return or it would be clogged. So the dr ordered a scan to find out what the problem was, well a blot clot formed around it, so I had to have it removed and got a replacement on the other side of my chest. Now I’m on blood thinners to shrink the clot but in the mean time I get the tingling sensations in that area and it feels really weird and I’m kind of scared. I haven’t told my dr yet but I plan on it this week at chemo. Have you found out what it could be? Oh so sorry to hear you had a blood clot. Hope you have told your doctor about it! Thank you for your informative blog. A friend whom I have known more than 30 years just had her second chemo treatment for breast cancer. Reading your words provides solace–she will get through this! and give her much strength! Hello Denise, my mother had her chemo port removed today. The area has been stitched up and she is feeling OK barring the pain. She feels like there is a sharp needle in there. The area is not staining. But it looks red and tender. Is this normal? or the pain keeps up tomorrow, I would call the doctor! So glad she got it out! I’ve had my port taken out over 4 years ago and I still get phantom pain every once in a while! I am so relieved to find that so many people have pain and discomfort from the port insertion. I swear, the nurses and my oncologist are acting like I am the only one who has ever complained of this. Mine was installed on Tuesday, and on Saturday I am still sore, with a large bruise and in pain. And then, I wanted to put on a sports bra today and it was impossibly uncomfortable. What kind of bra can you wear with the port installed right where a bra strap goes? hooked in front with velcro. As I said, the port insertion hurt more than my Mastectomy which is ridiculous to me! No one paid any attention to my complaints about the pain. It will get better, but it is tough while you are enduring it! I wrote about this on April 7th…see above. I learned to enjoy life without a bra and continue to be the same today. After this much time, I still have a very noticeable bruise where the port was, and I’m beginning to think it will be with my all my days. There is no more swelling and no pain, but I honestly don’t know what I’d do if they every wanted to insert another port. God forbid! Thanks for replies, everyone. I found a couple of bras with wide-set straps that work (until they begin to dig in the arm pits). I had my first chemo treatment on 9/18. With Lidocaine cream, the pressure on the port hurt when the nurse first connected the IV, but then it worked, pain free. The area is still very tender, and the “bump” is very noticeable and ugly. Denise, is there a scar where the incision was made? it unless I go looking for it. It has gotten better with time. Thank you, Denise. I really appreciate your blog. I’m also lucky to have a large, supportive and loving family. removed, but for me, I was quite anxious not knowing what to expect! hi..I’m Shikha from India..My mother suffered from uterine cancer..she got a chemoport placed on the left side of the chest..but after 3 chemos her port was blocked coz of some mistake by the hospital people..the doctors had immediately asked her to remove it..but she hasn’t got it removed yet…can there be any complications or is it harmful if it is not removed?? please help and suggest..
Has anyone had swelling along with the pain after the port was inserted. Mine was inserted on Thursday. This is Monday evening and pain mostly is gone but I do have a large size lump which extends below where the port is? I am wondering if there is a problem. I am to start chemo on Wed. morning. Sharon, you should definitely call the doctor who performed the port insertion or your Oncologist. Thank you/ I will do that in the morning. Oh good, Sharon. Please let us know what you find out. Thank you, Denise! I feel a little more comfortable about removing my port (Love, love, LOVE my port!) which happens next Tuesday. after it was gone! I never miss it though! Good luck!! Today is my day for removing my port. 18 months this has been part of me.I wish they would put me to sleep because this is something that i just don’t want to do.I thought I would be happy to get this done it’s the last step of this journey. Hi Mary, I PROMISE it will be better than you think it will be. at the same time. Thoughts and prayers are with you. Having my chest port out next week after two rounds of chemo beginning in August of 2012 and then 12 months of Herceptin. I have (HAD?) HER2+ breast cancer. Had a double mastectomy, chemo, daily radiation and then Herceptin, which I completed four months ago. When my doctor said let’s remove the port, I was reluctant. She said she thought I was being superstitious .. afraid that if I removed the port, I would need the port. She said I could leave it, but suggested I celebrate being a survivor by removing it. So, Tuesday it is coming out. I am nervous about the procedure and reoccurance but full steam ahead. Like others, I find myself crying at the drop of the hat now when I was the tough one for everyone for the last two years…. Hi Phyllis – we are all superstitious when it comes to removing ports! You are not alone! port removal is a breeze! You just feel afraid because of all you have been through. I had port put in week and one half ago. Extremely sore and bruised. Can feel catheter across my neck; feels like strangling. Port was accessed for first time 2 days ago. After being untethered from port/pump yesterday, found blood all over shirt 6 hours later. Is this the norm?? and you should not feel catheter across your neck like strangling. Make sure you call your doctor right away and inquire. It is soooo hard to know. You don’t want to be a complainer with the doctor. But in your case, it sounds like it definitely needs to be checked to make sure all is well. Maybe this is a crazy question, but I am half-way through chemo, and have a port. I am thankful as my veins are awful for a simple blood draw but boy do I hate this thing. I cannot bear to look at it. I had all the initial discomfort and thought it was just me. I had my port placed one day and started AC chemo the next. Needless to say that was not a fun weekend. Anyway I am doing chemo before my mastectomy, so is there any way they can take it out when I have my surgery. I mean they will be in there already. I am having a double mastectomy so any ideas? It would save me an additional procedure and boy would I like to wake up minus this thing after surgery. surgery after chemo to have the port removed then! One stop shopping so to speak. quite often but it must hurt like crazy! Good luck and YOU WILL MAKE IT THROUGH! Hi Jennifer, I’m with you, I absolutely hated that port. It sat right where tank or shirt straps sit, and was down right ugly. The only good thing about it was that all blood tests could be drawn through it, and obviously the chemo delivered. I had one nurse during chemo who gave me a shot of lidocaine just before stabbing the IV needle into it, I still thank her for that. I had it removed by my plastic surgeon when I had the tissue expanders replaced by implants and the scar has faded pretty nicely. (It’s been almost 2 months). I wish you the very best, like Denise said, you can do it! Hi, I wrote in February 2013 about using a small pillow to help me sleep with my new port. Well, I just had my port removed. For me, the removal was the easiest thing I’ve had to go through. It’s lovely to lose the lump and to not dread seat belts anymore. Hi Carol – congratulations on having your port removed! I have had a chest port for two months now, it still hurts when bumped, and I drove 200 miles over the weekend and now it hurts a lot … I’m assuming because of the seat belt. Now I see that there are padded covers for seat belts, so might want to get one of those. Also, my port which has worked perfectly for the first 3 chemos, when we went to get it flushed out, they couldn’t get it to flush… One of the nurses came and had me put my arm up, cough a few times, and then it worked. Hope that it continues to work again later. I have been happy to have it, but it was not as “painless” as they said it would be. It is a kind of nagging pain, that is always kind of “there”, but it is worth having for chemo and blood draws. I can’t wait to get it taken out though. My port was in my left arm, right above the bend in my elbow & I, too, experienced the nurses in not being able to flush it after my first 4 chemo treatments (I had 8 treatments all together for my breast cancer). They would have to inject a certain fluid that took about one hour to ‘kick in’ and flush it for me. The nurses tried having me cough hard, bend (almost upside down) and wiggle my arms very rapidly. It was funny because at times, I felt like a monkey. 🙂 Even after I had the port removed (which was about 9 months ago) I still get nervous when something brushes up against my arm where my port was located, because I still have a little bit of ‘phantom’ pain where it was. My 6 year old niece has leukemia (ALL) and is at Stanford in CA. She just started chemo and cries during chemo because she says it hurts. Why is it hurting her so much? This is crazy. Why can’t they make her more comfortable? he is now 9 and doing well with the same diagnosis as your niece. I have a chemo port that was inserted in Feb’13 on the right side of my chest. It has been a good experience so far with the port. Recently, am seeing some swelling near the right side of neck. The swelling persists and after doing a ultrasound of the neck, they found thrombosis in that area. i see a small ‘bump’ on my blood vessel near the upper neck. Doctor checked it and said that if swelling increases or causes problems to me, he would get the port removed. I lifted some heavy items for 5-10 mins last week via my right hand (i never tried lifting anything heavily before this) and then i had a severe headache. While the scan did show the port is healthy and i took my chemo dose last week, i get some pain near that neck region and slight pain/discomfort while turning my neck towards the right side.I am feeling a bit weak ever since i lifted those heavy items. I really want to have my port as they said my veins in the hand are weak for chemo. I am just hoping that my port will work fine and the swelling/pain in the neck does not cause more discomfort. Please share your thoughts and thank you for such a wonderful service. Hi James so sorry you are going through chemotherapy and having port troubles on top of it. without thinking! I had a similar experience after moving some furniture without thinking. I’m being “deported” in a few days, and I feel more apprehensive about this than when it was put in! I’m 8 months finished with chemo, my scans and labs are all normal and both my Onc docs agreed it’s time to remove my port … I don’t mind the minor surgery to remove it, but I feel like I’m gonna miss it! on occasion! Wishing you well. Thanks for commenting to help others, Pamela! Oh gosh, Joan, I am so sorry you have had so much port pain. Thank you. That was very informative. It answered a lot of questions for me. Hi, I just have a question maybe someone or anyone can answer …I have had my chemo port in for 6 years now. I really never had any major problems with it, it was a little sore and uncomfortable at first but I got used to it. It is in my chest on the left side. I went through chemo like I was suppose to and made sure I was cancer free but I have never went back to the doctors. And here it is 6 years later and still have it in and now to scared to go and have it removed or even checked. It doesn’t bother me at all I have gotten used to it but I’m sure there not meant to stay in this long so maybe somebody reading this might have went this long and will give me an idea what to expect if or when I do go to have it removed? I get my port out this Friday. It has not been accessed since June 10th, but the drs office said it would be ok to remove it. It has been in 13months. I had great success with the port and could really do just about anything. I started using my weight machine back in Dec and lift up to 40 lbs now. The surgeon said it was ok. Some discomfort for about a week at insertion, seat beat on passenger side bothers it as it is in my right upper side. Sometimes hard to sleep on my stomach but ok most of the time. I will be glad to get it out and end this chapter of my life, God willing. Thanks for the info on your blog. great success with your port in! Thanks so much for the report! removed, but more sweet than bitter! Sometime during my 6 chemo treatments I noticed a swelling on my neck on my port side. Port removed Dec. 2013. Swelling and tenderness in collar bone area of neck remains. My doc has examined every time I bring to his attention, but he says it is nothing to be concerned about. Anyone else experiencing same? Hi.i just want too say I had mind remove over a month ago and I have been having sharp pain in that area it feels like some one is cutting me.whst can I do.? is cutting you is worth making a telephone call to your Oncologist immediately! Next month will be 1 year since port was removed. I still experience pain in collar bone area and neck especially if I exercise shoulder/arm. Pain is sharp. No one has x-rayed, but doctor said it is probably scar tissue and I will have to live with. I’m sorry not encouraging news. I’m new to this situation. Had a mastectomy October 14. Thought I was going to be able to get away with radiation only but, much to my dismay, lymph nodes were positive and I need chemo as well. My doctor said I could have a port or not. I said I didn’t want a port but, a lady in my support group strongly advised me to reconsider. I hate the thought of additional surgery but, she said it would be better because of damage to to my veins. Your thoughts? Thank you! Linda ports really really help. I didn’t want one either but so glad I did. You will be too! I agree with Denise. Having a port made receiving chemo somewhat easier. Also did not ruin veins. Thank you to all who shared. I had a port put in the morning and for a while my neck felt whiplash like pain tonight. Just reading how common the discomfort is makes me feel better. I’m going to grab my travel pillow tonight. Bless you all. all the trials of cancer treatment. I had 16 weekly rounds for breast cancer. It is one tough road. Glad you have the surgeries behind you. Sending you hope and encouragement!! I had that throat tightness as well. It actually felt like something heavy was in my throat especially when I would bend forward. Funny, but I was vacuuming one day and felt the slightest pop and shift and never had the feeling again to the same extent. I think something had to seat itself properly. Maybe try vacuuming? I also remember the surgeons and oncologists thinking I could have my port placed in the morning and get my first chemo in the same afternoon. We have to remember that they haven’t actually experienced the port placement so they don’t know. Thank goodness that schedule didn’t work out and I had a few days in between the two procedures. Praying for us all. Hope everything goes as easily as possible for everyone. When they placed my port I couldn’t move my right arm for almost 2weeks and the tube leading from port to neck felt very tight and painful. The hospital admitted to cutting my muscle and that’s why I couldn’t move my arm. I still didn’t know up was up with the pain with the tubing. Tonight I was reaching out for my phone when there was a loud painful snap ( like a rubber band pulled to the point where it snaps and comes apart) right above my port site. After the pain the tightness that I have been feeling is gone but I’m scared something happened with the port. My husband ( firefighter) who I woke up from a deep sleep said that if something was wrong I would feel blood build up at the site. I’m still very concerned so I was looking up what it could mean and that how I found your page. Do you have any suggestions? Is this normaI? I got the port in Arizona but now I’m back home in New Mexico and they don’t have a lot of experience with ports out here from what I’m finding so going to the hospital here seems pointless. If anybody knows any places out in NM that has port experience please let me know. Ps. please forgive my spelling and grammar my brain fog seems to be affecting my writing skills more then ever. Well, I would suggest you contact your Oncologist office about the port. Some people do have a lot of pain, but it would be safe to have it checked. is an infection or some other matter. Don’t let it go! Just had mine placed today, gotta say it wasn’t what I expected. It was a bit more complicated than I thought, guess I should have ask more questions. It is really sore right now but I’m sure it will ease up in a couple days. One day at a time, and I’m a tough, bullheaded woman, I will sail thru this! the port placement is, do they?! Sore is okay – real pain is not. I like your attitude, Dianna! Being tough and bullheaded will pay off! serve you well…sending my best! I had a port placed two months ago and it still bothers me. the incision is still red and has little bumps along the incision, anyone who says they will miss it is crazy.i have two treatments to go and I want it out. I also feel as if the port is bulging out of my skin like it wants out! I have continuous pain in my arm and shoulder since having the port and all they do is record it in their computer. To the woman whos child has leukemia his treatment should not be so painful. I am being treated for leukemia an d they give me meds during treatment. the pain comes after the four day treatment and the chemo and drugs are coming out. maybe they are giving too high of a dose. they have what is called fcr lite. they started me with this esp. if have severe reaction to rituxin. make sure you research the treatment being given and the drugs being given and the dosage of everything. and I don’t agree that we should just be brave. the people who are treating have no idea what we go through. if you complain about any pain they tell you,oh that ls normal honey. like I told my doctor one day when your turn should come for chemo then tell me its ok. i never get used to being stuck with needles. Hi Andria – thanks for posting and your port and chemo experiences! It will definitely help someone else! Thank you so much! health professionals have no idea if they have not been through it themselves. Hi Denise thank you so much for your words of wisdom. I have an port because of cancer treatment. I wanted to know how they will surgically remove it, I was just woundering. Thanks so much – can’t wait to have this removed!! Hope you are about ready to get that port removed! It is such a great day when that happens! GOOD LUCK! “sleepy stuff” during port removal!! I hope it is less tender now! Thanks so much for sharing. Just had my port installed this past Thursday. Like many posting here, no one told me what to expect after. It’s very uncomfortable, and a little painful. Starting chemo tomorrow and very apprehensive. Such strong women (and men) posting here. Prayers and positive thoughts to all. Denise, Thanks so very much for your blog. I so wish I had known about it when I had my port put in eleven weeks ago! I had no idea it was going to be such a hairy big deal and that it would hurt quite as much as it did for two weeks after. I was bruised all the way down my remaining breast (the port’s on that side) for three + weeks and still have a small bruise right around the port. The vein in my neck area where the “line” sits, is still tender and slightly swollen. Having crabbed about all of the above, I will say that HAVING THE PORT IS WORTH ALL THE PAIN, STRESS AND DISCOMFORT! I’m really fortunate because all three of my oncology nurses at Wake Forest have had cancer and chemo, so they are really, really knowledgeable and understand what we folks in the chemo pod are going through. You and the others who posted here have really reassured me about the port removal process. I have been anticipating getting it out with more than a bit of anxiety. It will be at least another 12 months before that happens, but you can’t blame a woman for some mental “rehearsing” can you? 🙂 I wish you and everyone that have posted here much love, strength and recovery! Maggie, thanks for posting! Oh my, you really did have a time of it with that bruising! SO SORRY! And you are so right! Have chemo nurses who had cancer and been through it – PRICELESS! You have to keep thinking, “soon it will be OUT! !” Best of luck to you and GOOD HEALTH returning! Thanks for the report very informative can’t wait until I am able to have my port removed I have finished all my chemo treatments and June will be a year since it was inserted. Stephanie – CONGRATULATIONS on being DONE with chemo! What an accomplishment! Yay Stephanie! I’m kind of in the same boat, am waiting to get mine out too, will be Sept. when I get mine out. Getting the port maintained isn’t a big deal, but it will be nice to lay on my stomach again, have the seat belt not irritate it, and will be nice to not have a constant reminder of my last year of treatments… still, I’m so glad that I got it put in. Congratulations on being done with your treatments! Praise God. My port was removed 1 year ago this past November, 2014. I am finally free of any discomfort related to it. In October of this year I started going to Silver Sneakers. The first time I used 4# weights I had major discomfort in port area. Dr. said probably caused by scar tissue. I continued with the program and pain/discomfort has disappeared. I can’t say the same will work for anyone else having problem after port removed but the exercise has helped me. Good luck to you and may God bless and keep you. Glad to hear you are finally free of discomfort, Pat! Wow. What an incredible group of women (and one guy!) I see here! I came to the site to find out if having bruising and tenderness all over my port site since placement 3 months ago is normal, but what I am leaving with is awe and admiration! You have all been through so much and come out shining. Congratulations to every one of you for having such resilience and courage. Thanks for your encouraging words to all who have posted, Paula! Gosh, bruising after 3 months isn’t normal – tenderness yes. My port was placed 3 weeks ago. I have extreme discomfort and am still bruised all the way down my remaining breast (the port’s on that side) I have had 1 chemo treatment prior to placement. When the port was used a week ago for the first time I started bleeding after the chemo was given. The blood was very dark and the nurse suspected that I had a hematoma. Since then the area around the port is still bruised and I am through antibiotics and is currently on an anti-inflammatory drug. I am not sure for how long I still need to drink the medication. I was diagnosed with breast cancer and was very positive about the whole situation, but since the placement of the port, my moral is very low. Hi Annalie, so very sorry about what you are enduring. Has a surgeon looked at it? Hi, I had 2 ports one abdominal, one chest. I had both removed Dec 30, 2014. The abdominal healed very quickly, I can see the scar but forget its there. My upper port has not healed as quickly. It is itchy and a little bumpy. I am wondering if it might be the stitches dissolving? I has been over 3 months. Did anyone else have issues? It was only in for 6 months, the abdominal port 4 months. I asked to have the upper removed when they took out the abdominal. The Dr. hesitated but did remove it. That was in Florida were I had easy access to care. I am now In MT and would have to drive 2 1/2 hours to have the port flushed every 4 – 6 weeks. I had a lot of discomfort with the abdominal port – very little with the chest port. But, they got the job done and saved a lot of wear on veins. I am to talk to the doctor Monday about getting a port. I have a cruise on June 29th. Is there a time limit of when you have to begin chemo. I don’t want to start chemo until I get back from my cruise. I have a question, I get horrible stabbing pains where my port was and it’s been out for 3 months. Is this normal? I too had a double mastectomy with reconstruction. I was 41 at the time of my diagnosis. I have a question, I had a chest port (right side) for 18 months, loved it since I have very bad veins. Never had problems with it other than the whole seatbelt discomfort. Removed 2 yrs ago without any problems. Now I have noticed a lump a little past the END of the scar, more toward the armpit area. My question is can scar tissue develop 2 yrs later and does it move around when you push on it? I have appointment with my PCP tomorrow since I don’t like the new oncologist my insurance tells me I have to see. I had my port placed 7 weeks ago and no one told me how painful it would be afterwards. Immediately, in recovery my neck hurt really bad. I was also really bummed with the port placement at first because I had to miss my first tennis match of the season. Since having it placed, I don’t have pain but have to serve underhand because it hurts and I am fearful to serve normally. I started chemo the day after the port was placed but luckily, they left it accessed when the put it in so I wouldn’t have to do it the next day. I am having weekly carboplatin/taxol chemo for 18 weeks for ovarian cancer. The travel pillow really helps and I take it in the car to place under the seatbelt as well since my port is on the right side. I think the port has been great for chemo since I have terrible veins and blood draws and chemo each week. Also, my port was placed incorrectly – my incision goes right through the middle of the port instead of the port being below the incision which makes it extra difficult for the nurses to access. The doctor told me they messed up the length of the tube and I had the option to have it redone. If it works, I guess why fix it and the numbing cream an hour before accessing it helps with the pain/discomfort when they access it. Great blog and glad to hear I am not the only one with port issues. and watching her go through that was so hard – harder than it was for myself going through chemo. Having your best friend of so long who is so small and wasting away in front of your eyes is so devastating. I had Breast Cancer 10 years ago & had a Port put in to receive Chemo. Please let know ASAP. My appointment is tomorrow at 11am. and surgeon. Wishing you the best….so sorry I cannot be of assistance. I had port removed about a month ago…notice sometimes when I move my head down on that side of my neck it hurts and feels like it should be swollen but it’s not. It is only on the side where the port was placed. The site where the port was removed is still red. Am wondering if it is just scar tissue forming from the area where port was and where the wire was in the neck area. Had my port removed a few months ago. The doctor was very hateful. Now i have nerve damange and feels like things in my mouth on the bottom and my neck feels numb!! Do you have a answer or a kind of doctor I should see– been to 4 and 3 Dentists– still got problem. I had my port placed October 20. I have had near constant pain right around the large incision. I was told they had problems getting it placed, so my scar is right across the middle of the port. I have a bruised that has developed right smack in the middle with a raised bump. I’m afraid it is a blood clot. I have chemo scheduled for later today, so we will see what they say. It has been accessed twice so far. The 2nd time they could not draw blood out of it but could get fluids in. I have 5 sessions of chemo left for stage 2 breast cancer plus one year of herceptin. I don’t want to lose the port, my veins are horrible. Fingers crossed for good news today! know what happened! GOOD LUCK! Hi. Thanks for the info you share on port removal. Diagnosed with colon/liver stage 4 in June 2011 and had the port put in a week later. So here we are and it’s finally getting removed in December 2015! Scared and excited at the same time and reading your blog gives me a good idea as to what to expect. I have low platelets (60-70) so know I’ll be a bit of a bleeder during removal so hearing about pressure placement and length of time for the procedure is really helpful. I feel more prepared now so thank you for that. Maria, CONGRATULATIONS – what a fight!! You give everyone HOPE! phantom port pain! But it will be so worth it! My daughter is having her port removal on Tues. she is 40 years and special needs. She is in remission from Hodgkin’s. She is so happy to get that thing out and so am I. She has a cold and has been coughing. That is how all this started with a lingering cough. So I am worried. Her cat scan was great. Ugg! Congratulations to you and your daughter for her port removal! going through chemo, I found. But of course you are worried. Hey Denise, I had my port removed yesterday, but my concern is that a piece was left in my neck. I spoke with my mom and she says that its probably just the tissue has become hard. Have you ever heard of that? I had my port removed 2 months ago and I have scar tissue that stills bothers me. It will itch and I tend to pick at it. So don’t worry, I’m Sure its scar tissue. I was never so glad to get it out. They removed it when I had my mastectomy. I had my port placed 1/4/16, at my left clavicle, and have had to take pain meds left over from my recent partial mastectomy. Reading the previous comments, I think it’s safe to say the pain is normal but I didn’t realize it would be to this extent. The radiologist assured me all I would need is Tylenol. I feel frustrated because I went back to work two days later and am very uncomfortable with extending my arm. I don’t randomly take pain meds but feel the need for this occasion. Hopefully with a bit more time the pain will subside. First chemo treatment is 1/12/16, the day my sutures are to be removed. Small price to pay; it could always be worse! issues. But we also both agreed, it was worth all of it to save our veins! I hope you prove this to be the case as well. I did not have breast cancer – diagnosed with ovarian clear cell carcinoma in June 2014. Had hysterectomy and lymph node removal, followed by chemo. I am 15 months cancer free. My onc suggested that I leave the port in place for up to 18 months post chemo, so I’m almost to that goal. When did you know the time was right to have the port removed? the advice of their Oncologists, so seems like you are close enough to get it removed!! I was diagnosed with NHL in late Dec 2015; started Rituxan-Treanda 21-day interval cycle in Jan 2016. I completed 2 of 6 3-day infusion cycles last Thurs via IV. Sunday found lumps in my forearm. Since I have 8 more days of Treanda, is it worth getting a port at this point (saving my veins), or given the pain/discomfort of port insertion take the chance that my veins will make it through? Hi Jennifer – I would ask the chemo nurses – they are good resources as they see so much. Hi Kaye – everyone doesn’t but it is not unusual to have different side effects every time. Hi – thanks for writing. Hope you are doing well. I am not the manufacturer, so I am not sure about ribbon emblem. Hello Denise, this group uplifting and heartbreaking. I was diagnosed with Triple Negative Breast cancer in August of last year, had my port put in on September 28 and had my first Chemo on October 1st, 2 days after my port. I was shocked that they would do it so fast. Had my mastectomy February 8 and begged them to take my port out, which they did. I hated that thing. It bulged through my skin and it was hard to sleep but I was grateful to have through Chemo. Now I’m 2 days from my last radiation. I just pray I never have to go through that again. Bless you all that have walked through this nightmare we call cancer. never put another chemo port in anyone. Of all the comments I’ve been reading since I found your blog, I have yet to hear of other ladies with ports placed in their arm (like myself). Is there anyone that you’ve heard from that had their ports placed in the arm and if so, I’d like to offer advise on how to lessen the scar that is left after port removal….I used Lancome VISIONNAIRE on the scar and within about 2 months, it’s virtually gone now. Hi Sherri – you know I’ve not heard from anyone with a port in their arm!! like it would work in other places! Congratulations on 3 years cancer free! Thanks for the info about this product!! I had my power port removed withinn the first year of placement because it developed s leak. The unexpected! acute onset of pain, along with what looks like a vein, but hard to the touch, and sharp burning continues until I manipulate whatever this is! to be pushed back down into my right chest wall where the port was. Any idea what the approx. 2″ tubular object is, and why this happens without warning? Thank you for this post, I am getting a port on Monday july 18 ~ the beginning of my chemo treatment for uterine cancer. I had breast cancer 12 years ago, and they did not put in a port and my veins are shot! Very fine, hard to find and not good to use. I am thankful that this time I will have a port, I was not looking forward to those needle adventures trying to find a vein! Thanks for sharing! The battle begins! as you fight uterine cancer! cancer free and getting that port out – YIPPEE!! Congratulations! The chain continues. I was diagnosed with a simple DCIS stage 0 in April which then led to the discovery of another tumor. Multi focal, triple negative stage 1a. Since I was told that there was only a 1-3 % chance of having that second tumor I opted to have a double mastectomy along with immediate diep flap reconstruction. Wow, you can’t ever be prepared. Still happy with my decision. Just as my breasts were starting to not have such sensitive nerve endings constantly bothering me I got my port installed today. Presto, its like it turned every nerve back on, yay with great sarcasm. I also seem to be having a lot of itching (which I find strange since I still have a lot of numbness in the chest area in general), I found your page just like you had said, pain with the port installation and researching its normalcy. Just like others I was told Tylenol would be enough. Hmm, I do not like taking meds at all so I still have quite a bit of oxycodone from my surgery which I took half of one along with Tylenol and the only thing it is doing for me is making me a bit tired. I just started to be comfortable the past 2 days lying on my right side since the left is out and now I have this on my right side and a lot of discomfort. So I know after reading through this is day one but boy I am hoping to be someone that becomes comfortable with this quick. I was trying to find out about if heat or cold packs or anything would make it feel better. Today is 9/6/16 and chemo starts 9/19/16. Can’t imagine the poor souls that started within a couple of days. I just want to say you all rock and thank you for sharing your experiences. I need to hear the positive too as there is just too much weight sometimes with the negatives. I’m bummed as my son was so happy we got to the point of being able to give almost real normal hugs and here I am again. I’m hopeful for good hugs soon:)… My apologies if I have continued too long:)..
Hi Lora, thank you for sharing your story!! So sorry about all that you have been through. PORT PAIN – yikes, I still remember it! If it is too bad, I would place a call to your Oncologist. Like you, I had to take some pain meds with it, and I hate those. And you will be okay when chemo starts. thank goodness. They numbed it and she had no problems. She did not have port pain like I did and like you did. can I sleep on my side I’ve got my port Cath in? I have the port for doing my chemo so far I’ve not had the breast cancer removed yet so is it ok to lay on the same side my Cath is on? I was able to sleep on my side (same side as port), but it took me awhile as I had a lot of pain. My sister all so slept on her side where her port was! Sending my best! Thank you for this information! My dad is about to start treatment and I have so many questions. You put all of this in such an easy way to understand. Hope you’re doing well! grueling, difficult time for everyone. Hello — Thank you for sharing your story and experiences, as you know, it really helps those of us that are just beginning our journey. I had my port put in a few weeks ago and had HORRIBLE pain, itching and swelling… I also woke up the next day with two swollen lymph nodes in my neck and the occipital lymph node on the back of my head was almost the size of a boiled egg! It was sore and stiff all week, but I had lots of appointments so I had to keep going. The radiologist was concerned when he reviewed mt PET Scan because the node on the back of my head lit up bright! He was considering a biopsy and sent word to my other doctor to check it out. Well, a nurse I had never met before was walking by as I was on my way out of the clinic and told me she could tell right away I was having a reaction to the steri strips… Within 10 hours of removing them I was pain and itch free — and all the swelling went away! Whew — what a relief!!! I start chemo and radiation Monday — I have a feeling this thing will be a very good friend by the end of it. tolerating chemo and radiation. Hope your port has gotten better! And WHO KNEW about steri strips reaction???!!! WOW, that is so good to know! What Can go wrong is when a power port is inserted into the chest,the tube isn’t inserted into the vein or artery at that time. I want to buy a port how much would it cost i am in urgent need of one please e mail me details . Denise, I don’t know if anyone has pointed this out or not but the port is not in an artery but is in a vein. I was wondering if anyone else has had blood cloting in their veins after having a port placed in their chest? Ten days after the port was placed in my chest my hand and arm began to swell, I am now on blood thinners, shots I give myself twice a day in my stomach. My Oncologist said we will start with the chemo and continue the shots for 14 weeks. I on the other had want to remove the port. Oh so sorry to hear this. I have heard from people who ended up with a blood clot from the port. I am having a port. Put in 10\25\17 because veins are after 19 treatments of opdivo for renal cell carcinoma this site had been very helpful. I also have not been told about the problems or pain this would bring. Noreen, hope you are doing well with your port! i have had my port in for 18 mos and have gained alot of weight i have very large breast and when i sleep on either side my port seems to move alot is there any way that it can come loose..and will it be harder to get out since i gained wight from chemo…. I always had to put a pillow under my side because my port would hurt so much. It should not be a problem to remove it because of weight gain. ALL THE BEST! I just saw this site and hope someone can give me an answer. I was having IV I G through my port in my chest and read that it has to be flushed every month. They cannot access blood through it and have never really been able to go so you can use my hand for blood draws. I just realize that it has not been used or flashed for three months . What is the danger of that I just discovered it today and of course it’s a weekend. so yes, I would recommend calling your doctor right away so it can be done. I do not know about the danger of it, but it is something that needs to be done. I appreciate your honest answer and also letting me know without alarming me that I need to check with the doctor tomorrow. I think it strange that they never have been able to draw blood from this port but they can put infusions in. Hello. I’m a non Hodgkin lymphoma survivor. I’ve had a port since 2012. It was placed in my right chest. Earlier this year, it clogged. It’s called a fibrin sheath when that happens. But since i was in the middle of a relapse, I needed my port. The port was removed and another placed in my left chest. I’ve not experienced pain with either. I have reached remission after 5 years of watch and wait. This was my 4th treatment. The port is definitely my friend. Mine is a Power Port. Love it! Hello, all. It was so nice to read all the interesting comments about Port insertion and Port Removal. I might add that having the PORT has done wonders for me because of my very tiny veins there is always problem finding them….So the PORT was like heaven for me. I’ve heard all the stories about ports that are in too long causing infections or calcifying…So of course i went to my doctor asking him to take it out. I’ve had mine in for 9 YEARS. He asks me if i am having problems, if it pains me, etc. I said No to all questions. He says well if its not bothering you leave it. Just have it flushed every three months. He mention a client that had hers in for 12 years and when she finally decided to take it out something happened which required her getting it put back in….hmmmm bummer. I must say in the 9 years i have had it in, I NEVER once had a problem of any sort. So I guess this is my friend for a while longer. never had any problems!! AMAZING!!! !